Home / Homepage / Is your Bank respecting your loyalty? Is your Bank respecting your loyalty? With interest rates at record low levels, debt is probably more manageable now than it has been in decades. But not all borrowers are feeling the same amount of “LOVE”; some banks have not passed on recent rate cuts to their existing customers and others have delayed implementing it. Most Banks will offer better terms and rates to NEW customers than they give to their own loyal customers. Having said that, competition can be stiff and the banks are fighting each other tooth and nail to win your business, where they have to. Our role is to make them earn your business. The Banks all have very clever Marketing and Research departments that have to balance keeping existing customers satisfied and to attract new business. All whilst raising Bank profits and keeping management and shareholders happy. In an attempt to prevent savvy customers making direct and relevant comparisons the Banks have many ingenious and ever changing tools to distract and confound potential customers. NAB will give you enough frequent flyer points for two return flights to London, but can have steep start-up costs. 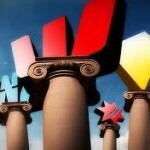 CBA has some very sharp interest rates, but the service levels can match the pricing. 20 other lenders have a blend of all sorts of enticements and “Shiny Objects” to snare the unwary. That’s where we come in. A skilled Mortgage broker spends all day, every day, in the mortgage market researching loans for clients. We are often the first to hear about special offers as the Banks know we represent a source of huge Volume introduction. These days more than 50% of mortgages are introduced by brokers. The Banks are also happy to cover broker costs from their margin as they make significant savings in staffing costs. These days most people don’t do their own dental work, cut their own hair or service their own car, but a surprising number still try and find their own mortgage. If there is anything you’d like to discuss, please make contact. I am here to help.